Description of exercises that can be done in hydrotherapy for arthritis of hip and knee, ankle and foot, shoulder and elbow plus wrist and fingers. Warm water exercise is an excellent way for those with arthritis to build up strength, ease stiff joints and relax sore muscles. Waters buoyancy greatly reduces the pressure on your joints, making it easier to perform needed range of motion exercise. A soak in warm water can help alleviate the stiffness of the knee caused by injury and arthritis. It provides an opportunity for exercise in an environment that puts less strain on muscles and joints, which is especially beneficial for those suffering from arthritis and joint pain. In hydrotherapy for arthritis and joint pain, the warm water increases circulation during exercise, and the buoyancy of water supports joints and muscles without unnecessary pressure. Walking Submerge your body and allow your muscles to relax, then walk in the water for five minutes to get your circulation flowing. Simply walking in waist-deep water can provide benefits for knees. Knee muscles and joints are used during every step, and lifting the knees up high works the muscles and joints even more. The buoyancy of the water will protect knees from high impact, unlike walking or jogging on solid ground. Knee Bends Bending the right knee while bringing the right foot behind the body works the knee and upper leg muscles. Knee bends can also be performed standing against the pool wall for support. Bend your right knee so that your right thigh is parallel to the water's surface. Straighten your knee and then bend it again, lowering your leg back down. Knee bends should be repeated while alternating legs. Knee Pushes Using the knees to push down items in the water strengthens muscles without force of impact. While holding the side of the pool for balance, pull your right knee up as far as possible. Place a flotation device underneath the right foot, such as a flotation noodle, and use leg and knee muscles to push the item down to the bottom of the pool. Repeat this exercise with the other leg, but continue to hold onto the side of the pool for balance. Knee Extension Exercises Knee extension exercises can be done in water with ease. Enter a swimming pool and hold the edge of the pool standing with your legs completely immersed in the water. Slowly raise your leg, bending the knee at a 45-degree angle and then relaxing it again. Do this exercise for both knees for at least a half hour every day. A body weighs 50 to 90 % less when in water; the percentage varies according to the depth of the water. This helps reduce the discomfort and resistance of any knee exercise and also allows extra exercises to be done with more exertion and less pain. Leg Raise The exercise is similar to the knee-raise exercise. Stand in the water on one leg with a slightly bent knee while holding on to the side of the pool or other support. This time, the leg is kept straight and raised in front of you as high as your range of motion allows. Lean slightly forward and raise the leg behind you. Then raise the leg off to your side, although the range of motion for sideways raising is naturally limited. This exercise also strengthens the hip, leg and lower back muscles. Squats under water Squatting in deep water is excellent closed-chain-kinematic exercise for strengthening quadriceps and hip muscles. Water Cycling Lying on the bed or sitting on the stool, cycling legs forwards and backwards. 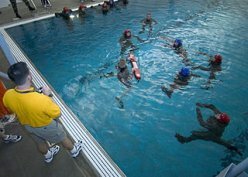 Aqua aerobics Aqua aerobics or water aerobics exercises are some of the best swimming pool exercises that you can try for weight loss. 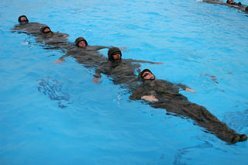 There are numerous water aerobics exercises that you can easily learn. Water cycling is an easy and effective water aerobics exercise that you can try. To perform this exercise, you need to find support of a pool wall and then place your arm over it. Make sure you can hang from that wall, without slipping down. If you are not so confident, then you can simply wear a swimming tube and put your arms over it. Now, that you are hung comfortably on a support, start cycling. Continue cycling for about 20 minutes and increase the duration gradually. Do an ankle bend by sitting in a spot that offers back support and straightening your knees. Bend your ankle and point your toes down. Then point them up toward the ceiling. Next curl and straighten your toes. Finally, make inward circles with your foot by moving your ankle, followed by outward circles. Perform ankle inversion and eversion exercises under water. Do these exercises for each ankle and foot. Work your shoulder with a forward arm reach. Raise your arms upward and forward as high as you can. Do one arm at a time if one arm is weak, helping the weak arm with the stronger arm. Further work your arm with a sideways arm reach. Raise your arm out to the side slowly. Keep the palms facing down. Go only to shoulder height. Lower your arms and repeat. Do arm circles by bringing both arms up and forward, keeping them a couple of inches below the water level. With straight elbows make small circles with your arms. Make bigger and bigger circles, and then make the circles smaller and smaller again. Perform scapular elevation and depression exercises in water. Next progress to protraction and retraction of scapula. Do horizontal arm adduction exercise with thumb pointing upwards and horizontal abduction of arm with thumb pointing downwards. Strengthen your elbows by bending the elbows under water and bringing your thumbs toward your shoulders. Then straighten the elbows again. Next, turn your arms so your palms face down and bend your elbows, bringing your fingertips toward your shoulders. Straighten your elbows, keeping the palms facing down. The warm water eases stiff joints and relaxes sore muscles and tendons. 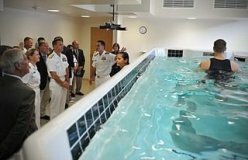 Thus performing finger and wrist joint mobilization is beneficial in hydrotherapy pool. Piano exercise: Keep your elbow close to body and both forearm horizontal to the water surface with palm facing down. Then flex and extend fingers of both hands one at a time as if playing a piano. Perform wrist circumduction under water with closed fist. Perform radial and ulnar deviation of wrist joint. Al-Qubaeissy KY, Fatoye FA. The effectiveness of hydrotherapy in the management of rheumatoid arthritis: a systematic review. Musculoskeletal Care. 2013 Mar;11(1):3-18. doi: 10.1002/msc.1028. Epub 2012 Jul 16.